This project will endeavor to provide actual transcriptions of Marriage Applications, and other Marriage Records, as found recorded in the county court house and state archives. We are encouraging these transcriptions to be entire marriage books and/or rolls of microfilm. Transcripts will be accepted and files will be placed in the USGenWeb Archives directory of the State and County, where the marriage records were originally recorded. Please send Nothing in copyright, unless you have written permission from the author. Volunteers!! are needed to make this project a success. 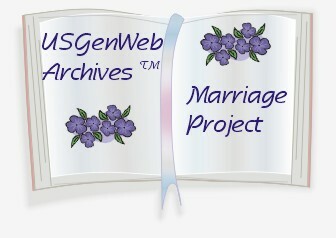 04-01-08 - New Form in use for submission of Marriage Records, or any other contributions that you would like to add to specific areas of the MIGenWeb Archives.